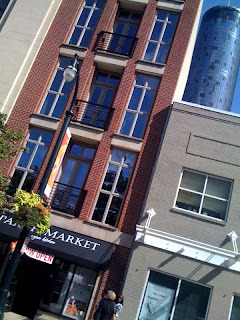 Parish Market Cajun Kitchen recently opened in the heart of downtown Atlanta. Located on Luckie Street below a stack of condominiums, this new Cajun eatery is a blend of fast casual dining and a neighborhood grocery store. Serving traditional Cajun cuisine along with stocking items like gum and canned foods as well as Krispy Kreme Doughnuts delivered daily, this concept is reminiscent of New York. The owner hopes that the condo residents will find Parish Market convenient and useful for everyday living. Located in the Georgia State University campus vicinity, student travelers looking for lunch might not be willing nor have the time to travel quite that far. However, for those who live in the dwellings above and for nearby office workers, Parish Market Cajun Kitchen might just be the perfect substitute for Ted's Montana Grill across the street and a perfect compliment to the New Era Flagship store. Repeat Atlanta!